March 22, 2012 - Vancouver, B.C., Corvus Gold Inc. (“Corvus” or the “Company”) - (TSX: KOR, OTCQX: CORVF) announces the initial results from select intervals in the first 3 holes of its phase I Feeder Zone exploration program at the Company’s 100% controlled North Bullfrog Project near Beatty, Nevada (Table 1). Â These initial higher grade intervals are from holes about 400 metres to the northeast of the proposed Sierra Blanca pit and resource (as outlined in the just-released preliminary economic assessment (“PEA”) (NR12-07, February 28, 2012)) along 320 metres of strike and suggest continuity along the north-south trending zone, open in all directions (Figure 1).Â The Yellow Jacket target is one of several targets in the North Bullfrog District that the Company will be exploring in 2012 and is closely related to the existing resource incorporated in the PEA.Â The Company will follow-up on the encouraging results from step out holes to the west of Sierra Blanca (NR12-06, February 13, 2012), step out holes to the north of Jolly Jane (NR12-08, February 29, 2012) and these encouraging initial results from Yellow Jacket with a phase II program following the completion of its ongoing large diameter core phase.Â The phase II program will look to improve confidence and increase the current resource size with a mix of exploration and infill drilling. *Intercepts calculated using 0.1g/t cutoff with a maximum of 3 metres of internal dilution. Â Reported drill intercepts are not true widths.Â At this time, there is insufficient data with respect to the shape of the mineralization to calculate its true orientation in space. 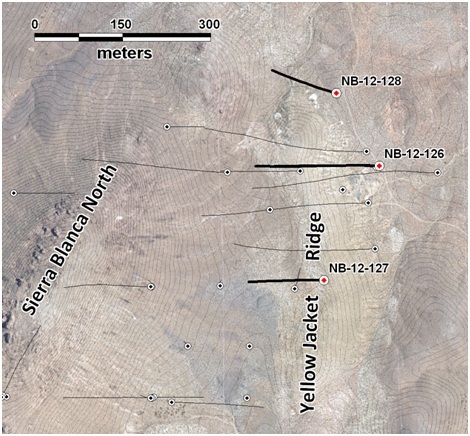 Figure 1: Yellow Jacket Ridge and the location of new holes testing the higher grade mineralization. Â Topographic contour interval is 2 metres. The Yellow Jacket target is in the northern part of the district and is currently outside pit perimeters utilized in the PEA. Â The phase I diamond drilling program included three holes producing oriented core to evaluate the geometry and continuity of the mineralization.Â The mineralization is related to the north-south trending Yellow Jacket and Liberator fault zone. The new core holes indicate that the higher-grade mineralization is closely related to the intersection of the fault zone and favourable relatively iron-rich lithologies in the dacitic sequence overlying the Crater Flat tuff. Â The recognition of this combination of structural and stratigraphic control has important implications for other areas on the property where the dacitic rocks are found. Â Additional targets at Savage Valley and Jolly Jane are being evaluated at this time using that concept. In addition to its ongoing drilling program Corvus, following the completion of its recent PEA, is assessing the potential for a two stage, fast track development project at North Bullfrog with the results expected in May. Corvus controls 100% of its North Bullfrog Project, which covers approximately 43 kmÂ� in southern Nevada just north of the historic Bullfrog gold mine formerly operated by Barrick Gold.Â The property package is made up of a number of leased patented federal mining claims and 461 federal unpatented mining claims.Â The project has excellent infrastructure, being adjacent to a major highway and power corridor.Â The Company and its independent consultants completed a robust positive PEA on the existing resource in February 2012. The Company cautions that the North Bullfrog PEA is preliminary in nature, and is based on technical and economic assumptions which will be evaluated in more advanced studies. Â The PEA is based on the North Bullfrog in-situ resource model (November, 2011) which consists of material in both the indicated and inferred classifications. Â Inferred mineral resources are considered too speculative geologically to have technical and economic considerations applied to them. Â The current basis of project information is not sufficient to convert the in-situ mineral resources to mineral reserves, and mineral resources that are not mineral reserves do not have demonstrated economic viability. Â Accordingly, there can be no certainty that the results estimated in the PEA will be realized. Â The PEA results are only intended as an initial, first-pass review of the potential project economics based on preliminary information. The project currently includes numerous prospective gold targets with four (Mayflower, Sierra Blanca, Jolly Jane and Connection) containing an NI 43-101 estimated Indicated Resource of 15 Mt at an average grade of 0.37 g/t gold for 182,577 ounces of gold and an estimated Inferred Resource of 156 Mt at 0.28 g/t gold for 1,410,096 ounces of gold (both at a 0.2 g/t cutoff), with appreciable silver credits.Â Mineralization occurs in two primary forms: (1) broad stratabound bulk-tonnage gold zones such as the Sierra Blanca and Jolly Jane systems; and (2) moderately thick zones of high-grade gold and silver mineralization hosted in structural feeder zones with breccias and quartz-sulphide vein stockworks such as the Mayflower and Yellowjacket targets.Â The Company is actively pursuing both types of mineralization. The work program at North Bullfrog was designed and supervised by Russell Myers (CPG 11433), President of Corvus, and Mark Reischman, Corvus Nevada Exploration Manager, who are responsible for all aspects of the work, including the quality control/quality assurance program. Â On-site personnel at the project log and track all samples prior to sealing and shipping. Â Quality control is monitored by the insertion of blind certified standard reference materials and blanks into each sample shipment. Â All resource sample shipments are sealed and shipped to ALS Chemex in Reno, Nevada, for preparation and then on to ALS Chemex in Reno, Nevada, or Vancouver, B.C., for assaying. Â ALS Chemex’s quality system complies with the requirements for the International Standards ISO 9001:2000 and ISO 17025:1999. Â Analytical accuracy and precision are monitored by the analysis of reagent blanks, reference material and replicate samples. Â Finally, representative blind duplicate samples are forwarded to ALS Chemex and an ISO compliant third party laboratory for additional quality control. Â McClelland Laboratories Inc. prepared composites from duplicated RC sample splits collected during drilling. Â Bulk samples were sealed on site and delivered to McClelland Laboratories Inc. by ALS Chemex or Corvus personnel. All metallurgical testing reported here was conducted or managed by McClelland Laboratories Inc. This press release contains forward-looking statements and forward-looking information (collectively, “forward-looking statements”) within the meaning of applicable Canadian and US securities legislation.Â All statements, other than statements of historical fact, included herein including, without limitation, statements regarding the anticipated content, commencement and cost of exploration programs, anticipated exploration program results, the discovery and delineation of mineral deposits/resources/reserves, the potential for the identification of a higher grade zone or zones at North Bullfrog, the potential for any mining or production at North Bullfrog, the potential for the identification of multiple deposits at North Bullfrog, the potential for the existence or location of additional high-grade veins, the potential for additional resources to be located between certain of the existing deposits, the potential for the Company to secure or receive any royalties in the future, business and financing plans and business trends, are forward-looking statements.Â Information concerning mineral resource estimates and the preliminary economic analysis thereof also may be deemed to be forward-looking statements in that it reflects a prediction of the mineralization that would be encountered, and the results of mining it, if a mineral deposit were developed and mined.Â Although the Company believes that such statements are reasonable, it can give no assurance that such expectations will prove to be correct.Â Forward-looking statements are typically identified by words such as: believe, expect, anticipate, intend, estimate, postulate and similar expressions, or are those, which, by their nature, refer to future events.Â The Company cautions investors that any forward-looking statements by the Company are not guarantees of future results or performance, and that actual results may differ materially from those in forward looking statements as a result of various factors, including, but not limited to, variations in the nature, quality and quantity of any mineral deposits that may be located, variations in the market price of any mineral products the Company may produce or plan to produce, the Company's inability to obtain any necessary permits, consents or authorizations required for its activities, the Company's inability to produce minerals from its properties successfully or profitably, to continue its projected growth, to raise the necessary capital or to be fully able to implement its business strategies, and other risks and uncertainties disclosed in the Company’s latest interim Management Discussion and Analysis and filed with certain securities commissions in Canada.Â All of the Company’s Canadian public disclosure filings may be accessed via www.sedar.com and readers are urged to review these materials, including the technical reports filed with respect to the Company’s mineral properties.